Im a little late on this picture. It was from Maxs 31st Bday. Jake was chomping at the bit all day to light the candles and dig into this sweet cake we made. Happy Birthday ya old man. 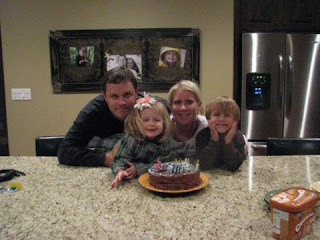 I bet your kids devoured that cake! Happy Birthday, Max! I I had to remind Paul that he turned 31 not 30 this year!